Griggs Dakota: Barn in the River. 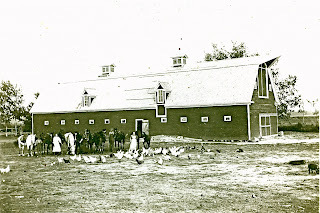 The barn above was built by Peter Port on his ranch in Sioux County, near Shields North Dakota. Peter Port was Farmer Fred's great grandfather. These large wooden barns were the pride of many North Dakota farms and ranches. This photo is dated 1913. The barn was painted red and had a loft or upper floor in the roof area to store hay for the livestock, as most barns of the day did. 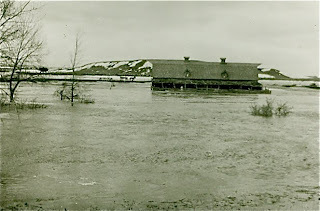 In the spring of 1943 the Cannonball River flooded and took the barn down the river. Lewis and Clark commented on their encounter with the Cannonball River as they traveled down the Missouri in October of 1804. It was quite a different body of water than the one that swallowed the Port barn in the Spring of 1943. The land dried out, the ranch continued, but the barn was not rebuilt. As my Mom taught me: Pull your hand out of a bucket of water and watch for a hole. That is how much things are missed when they are gone. Life goes on. Where was the barn located? It had to be nearer the Cannonball than the farmstead?? AdFarm: Thanks for Caring and Sharing!